Yonge Street is Toronto's most famous street, and it was once the longest street in the world according to the Guinness World Records. While it remains a very long street, that title was taken away in 1999. The issue surrounding the true length of Yonge Street stems around whether Yonge Street and Highway 11, which ends in Rainy River on the Ontario-Minnesota border, are the same thing. Without the extra length of that stretch of pavement, Yonge Street officially ends in Barrie. 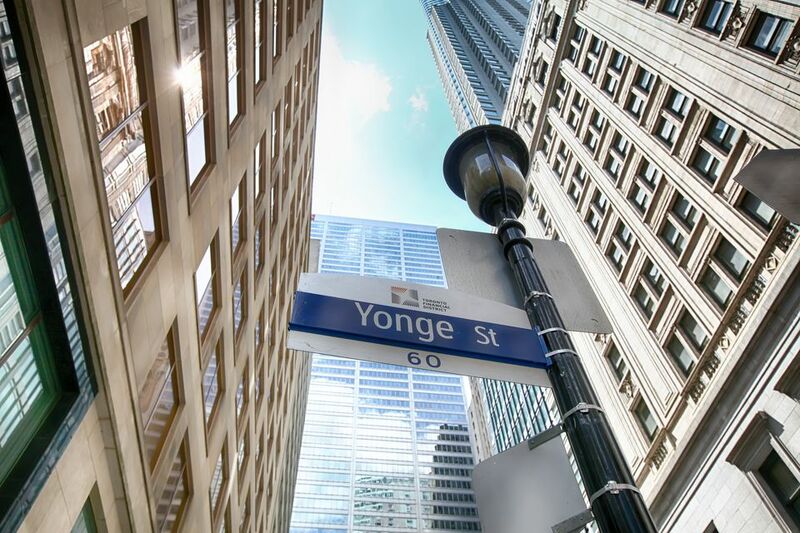 Yonge Street does remain, however, one of downtown Toronto’s most dynamic streets where you’ll find a plethora of things to see and do, whether you’re in the mood for shopping, catching a movie, heading to the theater or checking out some of the city’s major attractions. Shoppers take note: CF Toronto Eaton Centre features more than 250 shops and attracts almost 50 million visitors annually. The airy, light-filled mall is also the first Canadian shopping center to feature both a Nordstrom and a Saks Fifth Avenue. When you get hungry or need a break from shopping, there are a wide range of eating options here, from fast food outlets to sit-down restaurants. If want to check out another popular shopping area in Toronto, add Bloor-Yorkville to your list, located just steps away from the intersection of Yonge and Bloor. This is where you’ll find some of the city’s most upscale shopping—think Gucci, Hermès, Tiffany & Co., and Chanel. Yorkville is also home to numerous restaurants, bars and art galleries. Yonge-Dundas Square is a one-acre outdoor public and event space at the intersection of Yonge Street and Dundas Street, located directly across from the Eaton Centre. The square features a wide range of activities and events throughout the year and especially during the summer, including free outdoor concerts and movies, as well as seasonal festivals. Completed in 1977, the Toronto Reference Library is an architectural landmark in the city. The beautifully designed library features five floors surrounding a tiered atrium filled with natural light. Even if you’re not interested in browsing books, it’s worth wandering in to take a look. In addition, the library hosts a variety of author talks, readings and other cultural events all year long in Appel Salon. There’s also a Balzac’s Coffee on-site, which offers some of the city’s best coffee. Theater fans have several options to see a performance along Yonge Street including CAA Theatre, Sony Centre for the Performing Arts and Elgin and Winter Garden Theatre. These world class venues are some of the top places in the city to see renowned productions, and in the case of the Sony Centre, also musical performances, comedians and talks. Toronto’s Hockey Hall of Fame is home to the largest collection of hockey memorabilia in the world. You can get an up-close look at the Stanley Cup, watch films about iconic moments and unforgettable games (including the sport's first 3-D film), and go one-on-one against life-size, animated versions of some of today's greatest goalies and shooters. Located just behind Toronto’s CF Eaton Centre at Trinity Square Park is the Toronto Public Labyrinth. At 73 feet in diameter, it’s one of the biggest in the city and makes for a quiet way to spend some contemplative time in the city as you navigate your way through it. If you follow Yonge Street all the way to the bed of Lake Ontario at Queen’s Quay, you can hop on a ferry to head to the Toronto Islands. The Toronto Islands are home to beaches, parks, restaurants, walking and biking paths, as well as Centreville Amusement Park, and they are a scenic escape from the downtown core. The ferry ride is only about 10 minutes and costs less than $10 for transportation to and from the city. Silver Snail didn’t always reside on Yonge Street, but moved several years ago to accommodate more customers and more merchandise. This is Toronto’s premier comic books store, pleasing comic book fans for more than 40 years. In addition to all the comics, you can find T-shirts, action figures and even a café for relaxing with a coffee while reading your new purchase. Located near the intersection of Yonge and Queen streets, you’ll find Nathan Philips Square. More than 1.5 million visitors attend a variety of special events hosted at the Square each year, such as the Cavalcade of Lights, New Year’s celebrations, concerts and more. There’s also a large outdoor skating rink here that's popular with both locals and visitors. Skate rentals are available if you don’t have your own. Casual, friendly & vibrant, Calgary surprises a lot of visitors.